Brownie Fruit Pizza is a perfect project at your child’s next sleepover or birthday party. 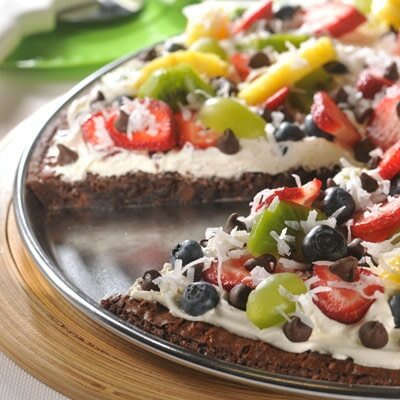 This brownie pizza topped with fruit will be a hit with the kids. Bake the brownie mix and Semi-Sweet Chocolate Morsels in a pizza pan ahead of time and then let the kids decorate with whipped topping and pizza-inspired fruit decorations, like pineapple chunks, strawberry slices and kiwi. PREHEAT oven to 350° F. Grease and flour 15-inch-round pizza pan or 15 x 10-inch jelly-roll pan. COMBINE brownie mix, oil, eggs and water in medium bowl until blended. Stir in 3/4 cup morsels. Spread onto prepared pizza pan. BAKE for 20 to 22 minutes or until edges are set. Remove to wire rack and cool for 3 minutes; loosen edge of brownie crust from pan with knife. Cool for 1 hour on wire rack. SPREAD whipped topping over brownie crust. Top with fruit. Sprinkle with remaining 1/4 cup morsels and coconut. Serve immediately or refrigerate up to 1 hour before serving. •	1/3 cup unsweetened applesauce can be substituted for the vegetable oil. Bake at 350° F for 15 to 17 minutes. •	Brownie crust may be made in advance. Allow to cool completely and cover with plastic wrap for up to 1 day.